Thanks to the death of Mike Brown, suddenly nearly every news commentator feels qualified to critique the tactics and motives of a small town police officer without so much as waiting for an investigation to conclude. People who’ve never even held a gun before are pontificating on national television about what officer Wilson should have done and why he did it. In defense of Wilson’s actions, I’ve heard arguments that he intentionally “aimed for his [Brown’s] arm first” in a valiant attempt to use non-lethal force to first disable Brown. On the other side, other people are angrily demanding that Wilson should have “shot him in the leg” first to merely injure him instead of going for the “kill shot” (his head). The implication is that Wilson intentionally executed Mike Brown when he could have just as easily–and much more humanely–“disabled” him instead. As someone who has trained with and instructed officers in the use of their firearms, listening to all of this embarrassingly uninformed Monday morning quarterbacking is infuriating. So if you’re like most people who have no familiarity with gunfights (in general that’s a good thing–congratulations! ), please take a moment to read this. My second and final contextual point is this: just as it is unjust to assume that all 18 year-old black men are violent criminals, it is equally unjust to operate on the premise that all white police officers are evil racists looking to execute innocents. Nor are they invincible RoboCops with the magical ability to shoot anyone in any part of their body at any time. Most are regular people just trying to do their jobs and hoping to not get killed in the process. This point is worth emphasizing. Think about your job. When it’s 2am and there are reports of yelling and gunfire in that sketchy neighborhood near you, does your boss order you to drive over there to “check it out?” Do you routinely have to handcuff aggressive, dangerous criminals? Are there popular songs glorifying the indiscriminate murder of people in your profession? Do you have any kind of reasonable expectation that you might get shot just for doing your job? Cops do. To reiterate, I am not defending the police state or many of the unjust actions of some police officers. But put yourself in an officer’s shoes for just a moment: your job is to protect the rest of us from the very worst elements of society–elements that are often armed and would really rather see you dead. Myth #1: Police officers have time to deliberate during a violent confrontation. The Truth: Gunfights are short. According to firearms manufacturer Beretta, the average gunfight is over in 3-5 seconds. Now consider that the average man can cover 21 feet of ground in only 1.5 seconds, meaning that if you’re 21 feet away from a man who is charging toward you, you don’t have the luxury to pause for a second to decide how to react; by the time you do, he’ll be on top of you hitting you, stabbing you, taking your gun, or whatever. He’s already decided what to do, even if you haven’t. In the alleged audio recording of the shots fired by Darren Wilson, the first six shots happened in roughly 2.25 seconds, followed by a 2.6 second pause, and then another four shots in about 1.75 seconds. That’s 6.6 seconds total. Why did Wilson pause? I don’t know. It’s reasonable to assume that he paused to assess the situation, either because he was trying to execute Brown and stopped shooting for a moment to see if he had been successful, or because he had originally started firing because he was scared of Brown’s aggressive charge and stopped to assess whether or not Brown was still a threat. I tend to think the latter explanation is more plausible, but what I do know is that those first six shots were all aimed at the same location. And those last four, they were all aimed at the same location as well. How do I know this? They were fired too quickly in succession for Wilson to be making multiple decisions about where to aim. Might he have taken those 2.6 seconds in between the two volleys to assess and then change his point of aim, so that the second volley was aimed somewhere else? Yes. What does that mean? I don’t know, but withhold judgement while considering the next two myths. Myth #2: Aiming for specific body parts is, like, a thing. The Truth: Accurately shooting a pistol is hard, especially in a stressful situation. While the movies make it look easy to hit someone in the leg or arm, or to shoot the gun out of their hands or smiley faces into targets, these things are decidedly NOT easy–and sometimes damn near impossible–for a number of reasons. Let’s take legs as an example: legs are just a few inches wide. 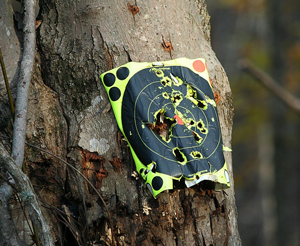 Even in a calm, stress-free environment with all the time in the world to aim (like at a firing range), people routinely miss targets that size from close range. Now add adrenaline (which affects, among other things, fine motor control), massive time constraints, and chaos, and hitting a stationary leg becomes much, much more difficult. And, as you may have noticed, most legs aren’t stationary most of the time. Officers aren’t trained to aim for legs or other body parts to “disable” perpetrators. Trying to do this would be waste of precious time, during which an officer is concerned that his or her life is in grave danger. And it’s a waste of precious resources–bullets are limited, and if the situation suddenly takes a turn for the worse, the officer better not have spent five rounds trying to nail a guy’s stupid kneecap because he saw Rambo do it once in a movie. The plain truth is that the officer is unlikely to hit a leg anyway. That’s one of the reasons that police are trained to hit the “center of mass” (chest area), because it’s a big target that doesn’t move and bob as quickly as other body parts. Basically, they are trained to hit it because it’s one of the few parts they actually can hit consistently. In firearms training circles, there are anecdotes of gunfights in which cops and criminals standing just a few yards away from each other emptied entire magazines without a single hit on either side. In the case of officer Darren Wilson, to me the autopsy seems to confirm that he was aiming for the center of mass as trained. But he was hit in the arm several times, you say? Doesn’t that mean he was aiming for the arm? No. Obviously it could indicate a lot of things, including the angle of Brown’s body in relation to Wilson’s. But if we assume that Brown was facing Wilson and we assume that Wilson is a pretty typical cop and not Neo from The Matrix, then there are two probable outcomes that’d we’d expect in a situation like this. The first is that he hit where he was trained to aim: the center of mass. This doesn’t appear to be what happened, although arms move and they could easily have been out in front of Brown’s chest as he charged so it’s possible that Wilson was a better shot than the autopsy might make him look. The other probable outcome is that, confronted with a stressful situation–adrenaline coursing through his veins–Wilson did what almost every average right-handed shooter I’ve ever seen does: he pulled his shots down and to the left. It’s a textbook indicator of stress; instead of hitting center mass, the group of shots lands down and to the left from where the shooter was aiming (this has to do with body mechanics and how people tend to “pull” instead of “press” the trigger). Assuming Brown was facing Wilson, this would mean we’d expect shots to land in Brown’s right side, including his arm. And that’s exactly what we find in the autopsy. Myth #3: Shooting an aggressor is enough. The only way to surely incapacitate an individual is to shoot them in an area that incapacitates them neurologically (generally the eye box and axial skeleton). If they are shot somewhere else they will experience blood pressure loss and can function from two to 30 minutes depending on the severity of the wounds. During this time, while they are bleeding out, they can inflict significant damage to others with weapons or with their “dying” bodies. The notion of “shooting to wound” is a fallacy spawned by Hollywood and ignorance of how basic human anatomy, physiology, and the psychology of violence work. So back to Darren Wilson and Mike Brown: Wilson shot him in the head. Intentionally? We don’t know; if Brown was charging or had started to fall forward while Wilson was still firing, a headshot could easily happen by mistake. But even if it didn’t, taking a headshot isn’t murderous if you’ve shot someone several times elsewhere and they keep charging at you; it’s self-defense. The truth is that we don’t know why or how Wilson shot Brown in the head, but it’s ignorant to conclude that the mere existence of a head shot proves anything whatsoever about his motives. It’s too late–and you and I are too powerless– to prevent the train wreck that has been the media coverage of the Mike Brown shooting. But, unfortunately, it will happen again. Somewhere, sometime soon, an unarmed black male will again be killed by a white officer. And it won’t matter if the shooting was justified or not; the sensationalism machine will spin up and cable commentators will fill the time between commercial breaks speculating wildly about which body part the officer should have shot and why, or what the officer should have noticed if he had just taken a little “extra time” (an odd concept in a gunfight), or how many shots he should or shouldn’t have fired. When that happens, I hope you remember that the major media is great at entertaining us with gunfights, but not so great at actually understanding them. Next Post: Put your gun down, get shot? A very insightful article about gun control (and the recent shooting). Thanks for sharing.